Nuclear Medicine involves application of radioactive substances in the diagnosis and treatment of various diseases. ASHRAF Medical Division has a specialized ‘Nuclear Medicine Division’ to cater to the requirements of the doctors and hospitals that need products and services in this advanced medical specialty field. BTG plc, is a growing international specialist healthcare company, its mission is to bring to market medical products that meet the needs of specialist physicians and their patients. BTG operate in three business areas: Interventional Medicine, Specialty Pharmaceuticals and Licensing. In everything they do, they are guided by their core values and their Code of Conduct. One of their leading offerings, TheraSphere® (radioembolisation) is a low toxicity, targeted liver cancer therapy that consists of millions of tiny glass microspheres containing radioactive yttrium-90. The glass radioactive microspheres (a mean diameter of 20-30 micrometers – about a third of a width of a human hair) are delivered directly to the liver tumors. TheraSphere® treatment is typically a procedure that does not require extensive hospitalization. It is well tolerated by patients, and its side effects are normally milder than with many other liver cancer treatments. Because the procedure is directed to the liver tumour, there is minimal impact to non-targeted tissue. After treatment, most TheraSphere® patients are eligible for further therapeutic options because the procedure does not block the vessels of the liver. ITG, are shaping the future of Theranostics, which is a process of getting the correct therapy for the individual patient and at the correct time. ITG offer an unprecedented understanding in this radiopharmaceutical technology and innovative supply chain solutions. ITG take pride in being recognized as THE PLATFORM in radioisotope research and development. This confidence strengthens their commitment to striving for excellence in the further development of innovative, integrated, highly effective next generation radioisotope solutions. ITG Endeavour to stick to this path – doing so, they are capable to master future challenges successfully. ITG feel confident that our contribution to society and your health in particular marks a major step forward in changing our planet for the better. It is therefore their commitment to continuously bring most modern products to patients around the world and establish themselves as key driver of radionuclide theranostics. This sophisticated itG Ge-68/Ga-68 Generator is setting new industry standards as for radionuclides in PET imaging. The advanced generator technique enables the on-site production of short lived radionuclide Ga-68. Based on its unique metal free design and its low acidic eluent (0.05 M HCI), the obtained chemical purity of Ga-68 can be used directly for efficient radiolabeling processes. We feel confident that this highly attractive and most convenient itG Ge-68/Ga-68 Generator concept clearlyfacilitates your demand for highly effective Ga-68. Above all, we ensure an additional, beneficial amount of Ga-68 activity throughout the year. ITG is proud to have successfully developed and marketed the unique no-carrier-added form of Lu-177. This leading radioisotope proves significant superiority in terms of highest specific activity and radionuclidic purity. GMP manufactured itG Lu-177 n.c.a. is setting new standards for theranostics. Contrary to alternative Lu-177production procedures on the market which irradiate Lu-176 in the first place and thereby accept massivecontamination with long-lived Lu-177m (T1/2: 160,1 d), ITG has developed a unique and extraordinary advanced production route irradiating Ytterbium-176 in order to obtain highest-quality Lu-177 n.c.a. As a result of our sophisticated approach, itG Lu-177 n.c.a. offers highest specific activity and an unmatched radionuclide purity. 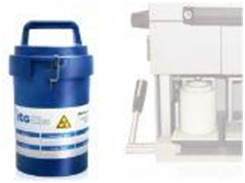 There is absolutely zero contamination with long-lived isomer Lu-177m which clearlyconfronts you with a serious waste disposal problem. Prostate-specific membrane antigen (PSMA) is a cell surface protein with high expression in prostate carcinoma (PCa) cells. Glu-NH-CO-NH-Lys-(Ahx)-[68Ga(HBED-CC)] (68Ga-PSMA) detects PCa relapses and metastases with high contrast by targeting the extracellular domain of PSMA. * First results suggest that this novel 68Ga labeled PSMA inhibitor is able to detect lesions much earlier even in patients with low PSA values. In addition, PSMA-targeted imaging shows a reduced background activity in healthy tissue. 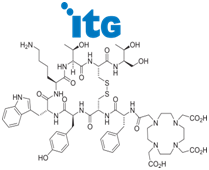 ITG are proud to announce that they have entered into an exclusive licensing agreement for pharmaceutical development and commercialization of radiolabeled DOTA-conjugated somatostatin analogue DOTA-[Tyr3]-octreotide (DOTATOC known as Edotreotide) for human oncology therapeutic use. Fully-integrated HPLC system for research and clinical routine in radiotracer-/radiopharmaceutical analysis. 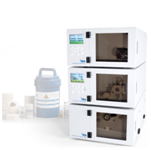 The itG Quality Control Solution, γ-spec Radio HPLC S 3710, is a ready-to-use system for n.c.a. 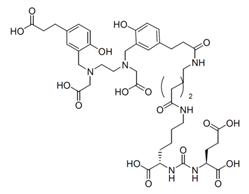 Lu -177, Y- 90, Ga – 68 radiolabeled peptides setting industry standards in terms of functionality and usability (in accordance with Ph. Eur. Standards). With an integrated quaternary HPLC-pump, UV detector and latest Chromstarworkstation 7.0 software, the γ-spec S 3710 is first-in-class to offer full Radio-HPLC technology within this extraordinary compact system. The central unit provides a shielded column chamber which minimizes radiation exposure of personnel to an all-time low. Institute of Atomic Energy POLATOM. 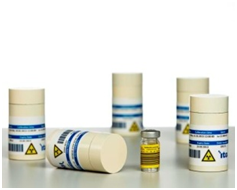 Radioisotope Centre is manufacturer and distributor of the isotopic goods applied in medicine, research and development, industry and environment protection. Activity of the company contributes to development of the nuclear medicine, biochemistry, radiochemistry, molecular biology and other branches, which apply radioactive isotopes. Standard solutions and sources for electronic measurement devices calibration. Dilon Diagnostics® designs, manufactures and commercializes innovative medical imaging solutions worldwide based on cooperative research and development with the U.S. Department of Energy’s Thomas Jefferson National Accelerator Facility and leading medical universities. Dilon provides complete digital solutions in diagnostic and surgical imaging. Dilon’s cornerstone product, the Dilon Molecular Imaging System, is a high-resolution, compact camera, and is available in two sizes. This compact camera is ideal for imaging small body parts, such as the breast, thyroid, parathyroid and bone. 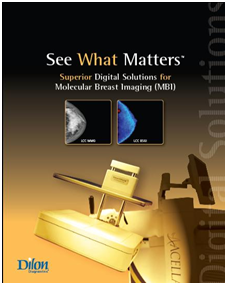 The Dilon Molecular Imaging System has been optimized to perform Molecular Breast Imaging (MBI/BSGI) procedure that aids in the effective management of suspicious and difficult-to-interpret breast cases. The MBI procedure and its accessory for MBI guided breast biopsy has proven to detect cancers missed by Mammography and Ultrasound, while leading to fewer benign biopsies than MRI. Dilon is the exclusive international distributor (most countries outside the U.S.) of Digirad’s lines of molecular imaging cameras including the ergo™, a large field-of-view general purpose imaging system, the Cardius® x.act, a triple-head cardiac dedicated SPECT imaging system with VCT Attenuation Correction, and the Cardius® XPO dedicated cardiac SPECT imaging systems line. Dilon is the exclusive U.S. distributor of SurgicEye’s declipseSPECT, the world’s first intra-operative handheld 3D tumor imaging and navigation solution for radio-guided surgery. 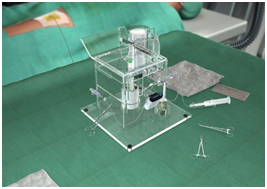 This intraoperative solution provides image viewing, localization and depth information, as well as the uptake level of radioactively labeled structures like tumors and sentinel lymph nodes. Partner of the CEA since it was founded, the Company designs and produces radiation protection equipment designed for the medical world, research, industry and nuclear protection. With over 40 years of innovation, and supported by itsscientific college of international experts, it has become the world leader in innovation in its sectors of activity, exporting its technologies throughout the world. 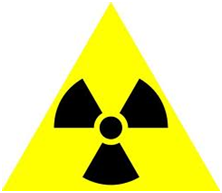 LemerPax is very actively involved in the optimization of the protection of operators exposed to ionizing radiation. Since 1998, NICESOFT has been developing innovative and creative solutions for Medical Imaging professionals, combining cloud computing technology and a high specialization in Nuclear Medicine. The complementary and fully-integrated range of products is composed entirely of zero footprint web-based solutions: – Venus RIS is a Radiology Information System with specific Nuclear Medicine modules (hot lab management). – Venus Explorer is a DICOM viewer with all standard processing and visualization features. – Venus Archive is a PACS. Store all your medical data and access it from anywhere. – Venus Share is a web portal that enables referring physicians and/or patients to access their medical records through a secured HTTPS connection.